These Fukushima decontamination bots are dying trying. Human workers continue the decontamination process at Tokyo Electric Power Co.’s Fukushima power plant on February 25, 2016. Not pictured: robots. When it comes to cleaning up a nuclear disaster like Fukushima, robots are the ones you want to call. Unlike human “decontamination troops,” machines don’t requires workers’ comp. You don’t have to worry about them getting cancer, and it’s fine to send them into harm’s way and work them as hard as you want. Plus, they’re generally better equipped than people to go into the heart of disaster, and come out unscathed. Except … they do succumb to nuclear radiation, we’re finding out. Japan has been sending bot after high-tech bot into the core of the Fukushima nuclear reactor to retrieve dangerous melted fuel rods, only to have them die in droves. When they approach the radioactive rods, the robots’ wiring gets short-circuited, rendering them effectively dead. At least three robots—and remember, each of these custom-designed machines takes two years to develop—have now perished in the continued effort to remove radioactive materials from the site. The failure of the Japanese authorities to realize they were sending in doomed robots may simply demonstrate just how dangerous the melted core of a nuclear reactor can be. Since the fuel rods melted through the core, nobody even knows exactly where they are, let alone exactly how much radiation they are spewing. Five years after the worst nuclear disaster since Chernobyl, human ingenuity and tech still haven’t figured out how to stop the radioactive leakage. About 7 percent of the Fukushima prefecture remains uninhabitable because of continued radiation, and 100,000 residents have fled the region since the March 2011 disaster, according to Bloomberg. The best chance for containing the radiation at the moment is an underground “ice wall” around the plant, to prevent groundwater from entering the site and becoming contaminated. But Japan isn’t giving up on the bots. Toshiba is now building remote-controlled robots with massive pincer arms, which will go into the nuclear reactor, dive into fuel pools, and pull out the offending fuel rods, according to the Japan Times. You can check out those beasties out here. 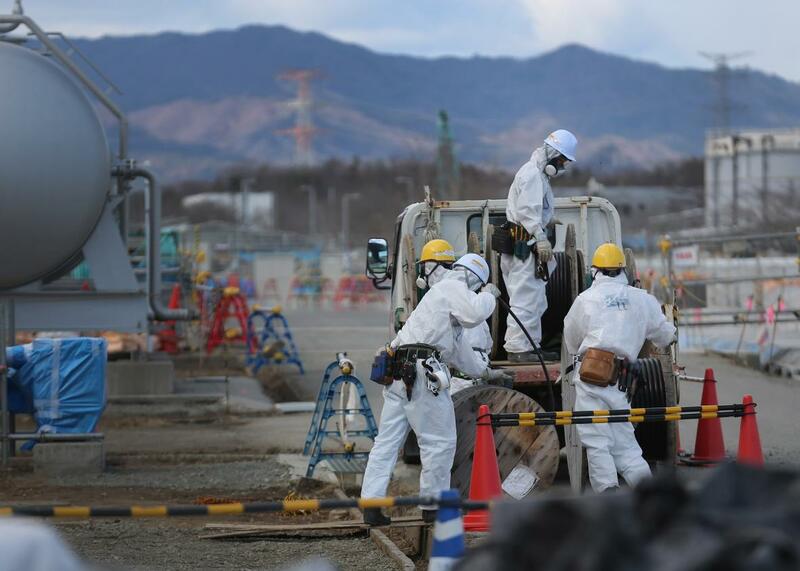 The need for decontamination has spurred an unexpected economic boom in the ravaged Fukushima prefecture. The region is now on its way to becoming a high-tech hub for “homegrown robot development,” with companies like Hitachi Ltd. and Toshiba Corp making “robots that slither like snakes or cruise through radioactive water like speed boats to investigate the flooded reactors,” Bloomberg reports. Fukushima is even trying to get its youth interested in robotics, with robot trade festivals like this colorful Robot Fest (“make Fukushima’s future with robots!”). Would you just look at that cuddly-looking smiley-faced robotic darling emblazoned with the Fukushima name! It’s practically the next BB-8. But don’t make them too cute, Japan. Just like you wouldn’t name a cow that’s headed for the slaughterhouse, you wouldn’t want to get attached to these robotic martyrs. Which does happen: Consider the adorable Sony robot dogs in Japan that inspired elaborate funerals by their owners when Sony decided to discontinue them. Or the military robots in Iraq that were known affectionately as “little bastards” by the soldiers who worked with them. So Godspeed, decontamination bots. But humans, remember: These machines were born to die.